ST. PAUL (July 2013) -- Skyline Exhibits, North America's leading innovator, designer and producer of exhibit systems, announces Skyline® WindScape™ -- a revolutionary air-powered and easy-to-transport system for trade shows and events. The cutting-edge technology was unveiled today at a launch event at Skyline's world headquarters in Eagan, Minn., and was simulcast at Skyline dealer offices across the globe, as well as at Skyline service centers in Orlando, Las Vegas, Chicago and Toronto. Skyline's WindScape™ exhibit system is the first system to use inflatable technology in trade show exhibit structures. It is available in 46 standard exhibit shapes, from small overlays and backwalls to large hanging structures and 16-foot-tall towers -- even as an entire inflatable conference room. Skyline® WindScape™ is made of extremely durable and lightweight materials making it easy to set up and take down. A full 10-foot backwall exhibit transports in a single carry-on case. Skyline® WindScape™ takes only minutes to inflate and deflate, reducing installation time while maintaining both quality and professional style. Skyline's inflator is powered by a rechargeable battery pack or plug-in that will work around the world. The structure is built around a fabric frame, and contains an inner air tube which, when inflated, creates a solid frame. This frame is covered by a wrinkle-free fabric graphic, which is always in place, but is also removable, so that messaging may be easily exchanged. "At Skyline, we believe in constant innovative thinking. We have spent years getting Skyline® WindScape™ ready for market, and this product truly demonstrates our deep and wide client commitment," says Bill Dierberger, President, Skyline Exhibits. "Because the time and expense for transporting and setting up exhibits is a major pain point for exhibitors, we know this product answers a major need. Clients that have already tested this technology are ecstatic. 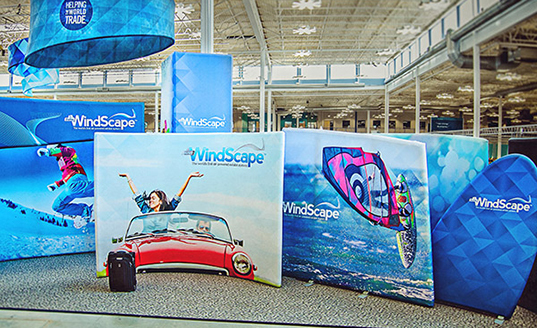 WindScape™ has made the entire exhibiting experience easier and more cost effective at every step. Pricing for the Skyline® WindScape™ exhibit system is comparable to the company's traditional systems - but significant savings will be realized with the reduced need for the expense of storage, installation, dismantling and shipping. Skyline® WindScape™ is also designed to easily integrate with other Skyline products and has undergone extensive testing for quality, safety and durability. "Skyline® WindScape™ saves money from shipping to drayage to labor and I&D," says Patti Stratford, Allianz Global Assistance. "I think it's perfect." Allianz was one of a few select clients that used the product prior to its official launch. Skyline® WindScape™ also is a new option for many other applications beyond trade shows, including events, popup stores, backwalls for TV studio sets or temporary private spaces like special event health clinics or smaller hotel conferences. "Skyline WindScape™ is an ideal choice for applications in which an exhibit or structure needs to be set up quickly, then packed up easily and transported," adds Dierberger.